A quick sketch for e-book I’m currently working on. I’m also experimenting with digital pencil lines, where I typically sketch with traditional pencil and scan. Saves time and trees, I figure. There are probably a bunch more, but suffice it to say, November is a busy month for some. Last year, I thought just to heap even more onto my plate, I’d make November a “sketch a day month” or SkADaMo, for myself. Just trying to get back to the early days of my blog when I feverishly posted just about every single day. When my synapses seemed to be firing on all cylinders and ideas where presenting themselves to me faster than I could sketch or write them down. Sigh. Those were good days. This exercise may not have gotten me back to that place completely, but it did get the ole synapses firing again. And I figure between attempting a picture book idea a day and a sketch/blog post a day, I’ll at least have a notebook/sketchbook/blog filled with chicken scratches of some sort or another again this year. Better than blank pages and outdated blog posts, I say. I even made a badge for myself last year and one again this year. I may be the only participant, but by golly I have a badge. If anyone wants to join in, they are more than welcome to grab the smaller badge, off to the side here and start sketching. No rules, just that. Quite a few folks decided to throw their hat into the ring and since there really are no rules or anything remotely resembling organization, I thought I would at least try to include a list of sketchers, right here throughout the month. Otherwise, there are no other rules, regulations, themes, daily words, Facebook pages or anything else resembling organization. Just lots of sketching, commenting back and forth and hopefully lots of inspiration and craft honing! If there are any broken links, bad links, I forgot anyone, misspelled anyone’s name or any other heinous act was performed, please let me know and I’ll do my best to correct it. Wow very impressive Linda, you did an amazing job last year, glad to see you are taking up the mantle again. I think I will give it a try myself as I am working on a kids chapter book and this may be the kick in the pants I need to keep a good pace. So what do I need to do officially to join you in your quest? How do I add your groovy SkADaMo button to my blog, or do I make my own? btw: are you sketching digitally with a wacom or a cintiq? I ask ’cause you have kept your line work pretty close to your traditional look and when i have tried it with my wacom I really can’t draw as well, just curious. Kevin, how fun that you’re going to try it with me! Actually, there are no rules, just grab the little badge off to the side and add it to your blog sidebar or anywhere you want to put it. You don’t really even have to do that. Maybe add SkADaMo to your tags, so you can easily access all 30 of your sketches. We can make stuff up as we go along, just mostly try to get a sketch a day up. BTW, I’m using a Wacom and using a Photoshop brush I grabbed from someone online and then tweaked with my own texture. I can give it to you if you’d like. Thanx Linda just posted my first a twofer since I missed yesterday. With so many folks throwing their hats into the ring, is there an easy way we can see each others work? I can’t seem to make the badge thing work and I’m not sure what to connect it to. I love chicken scratch…. count me in!!! Yay, Roberta! How fun that you’re joining too! See the above reply to Kevin, who is also joining for the very sparse rules, hee hee! Sketch on my sistah! Thanks again for inviting all. Have been looking for another great challenge to push the creativity this month! I have really missed seeing your almost daily sketches, Linda. In fact there are times when your illustrations trigger either a flash fiction piece of a children’s picture book story for me. And since I’m participating in Tara Lazar’s PiBoIdMo again this year, I look forward to any other inspirations your wonderful drawings may come my way! Awww, Donna, that is so sweet of you to say! If I’ve been even the teeniest trigger in your creativity, I feel honored. Yes, I’m hoping, also, that this gets me back in the game, not only in November but for good! I am in…gonna try and work this in conjunction with the PiBoldMo ideas I generate. Looks like my 10pm bedtime goal might be tossed out the window this month. 🙂 Thanks for the challenge. Oh wow! That actually sounds like a great idea. I might try that as well. Yeah, who needs sleep, eh? Good luck, Jennifer! Hee hee, that’s right Kev! Wow Dana! Well, remember, the only rule is there are no rules. If you miss a day here or a week there, no prob. Just sketch as much as humanly possible! The prize is a sketchbook-full and blog-full of sketchy goodness! Hey – that’s what I wanted to do too! So glad to be in on it with you! Welcome aboard Julie! On the badge, maybe it’s possible you grabbed the 2011 badge? The 2012 badge is higher up on the page on my sidebar. Let me know if you have any trouble with it! Can I join in too? 😀 will add the badge – I’m also doing PiBoIdMo for the first time this month and used to do illustration friday but keep missing it so will try to do a sketch a day. I did the Ultimate Blog Challenge in October (although did end up writing 20 in one day to catch up so we’ll see…). I just love meeting all these great people and being part of the gang. Welcome Tracy! No worries, there are really no rules, this is very informal, so what ever you can do is fantastic! I figure if you end up with even one more sketch this month than you would have because of this, you are a winner! Ah yes – not done one yet – unless you count the book I made for PiBoIdMo… Been far too busy but will be setting aside some sketching time over the weekend… Thank you! Just found out about this from jenn bower. Im a few days late coming in but I think i will give it a try! I’m a little late, but I think I would like to try this too. Maybe take my PiBoIdMo ideas and make sketches too. Yay Loni! Glad to have you aboard! There are no rules, so integrating PiBoIdMo sounds like a great way to go! Hi Linda, Albeit a little late too … I would like to join the sketch-a-day challenge. Do we sketch anything … or is there a word for the day? Welcome Sue! There are absolutely no rules. This was just a thingy I did on my own last year and invited others to join along, so not really any daily themes. Just whatever moves you that day… and have fun! Just signed up..a few days late but better late than sitting at home wishing I had the courage to put myself out there! Good for you Lisa! Welcome aboard! Congratulations Alison! Sounds like you are doing great! Nope, there’s no Facebook page this time. It’s a very informal endeavor. Since there have been quite a few peeps throwing in their hats, you never know, maybe next year it will get a little more organized. I’m in!! found my way here thanks to Julie Rowan-Zoch. I msut have missed the post in PiBoIdMo, but last week was insane…will be thrilled to try to get at least something sketched! Wheeee this will be fun! Welcome aboard Brook! It has been fun so far! I’ve accidentally already been taking part… http://bookcub.org/category/littledoodles/piboidmo/ I’m now officially in. Welcome Be a! Keep up the good work! I was thinking about starting something like this – wasn’t sure how to start or to share – so glad I found you! I would like to join up, I’ve been sketching with PiBoIdMo, so I have some daily sketches already. 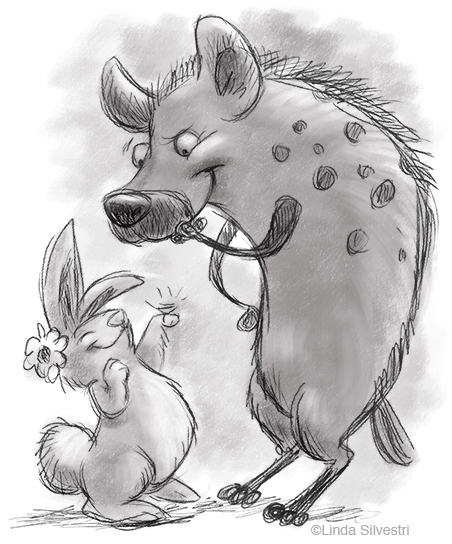 I love your sketch up top with the hare and hyena. And love-love-love your kitty. Also – must say your SkADaMo has a certain bluesy-jazzy sound to it…I like it! Welcome Laura! I added your name to the list! Of course! Welcome aboard! I’ll add your name to yesterday’s list! okay, I just heard about your great challenge from Laura Miller’s blog. I realize I’m arriving late to the party but count me in! Great Lisa! Just added your name to the list! I’ve been participating since Nov 2, but haven’t gotten around to posting. I finally scanned a bunch of sketches and will try to post them in groups. Thanks for the inspiring idea. It’s been great so far.